Monday – Geneva, Switzerland 23 October 2017, Liberia debuted at the UNCTAD Multi-Year Expert Meeting in Geneva on Transport and Trade Logistics. 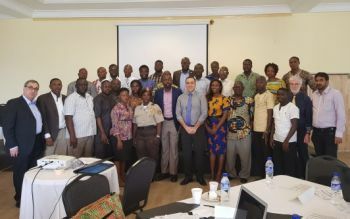 Deputy Minister Stephen Marvie, Jr. presented at the Multi-Year Expert Meeting and showcased the work Liberia has done through capacity development under the UNCTAD Empowerment Program. Deputy Minister Marvie also spoke about the need to support Liberia’s trade policy program with additional support for trade portal and automated platforms for trade facilitation. The Honorable Deputy Trade Minister also held a one-day working meeting at the Swedish National Board of Trade in Stockholm, Sweden. The meeting outlined the work program for the rest of the year. The Ministry and NBT agreed to support the work of the SPS and TBT teams as they prepare to participate in meetings in Geneva – a first in the post-accession program. It was agreed that Liberia will host a Trade Facilitation Communication Workshop in November and a field mission in Buchanan, Grand Bassa County. The annual project planning meeting to discuss the final phase of the NBT technical assistance is scheduled for the last week of November. It was also agreed that additional support may be needed and could be sourced for SPS and TBT. The NBT was represented by Anna Hallam and Mattias Jernbäckers, as well as other techincal advisors from the NBT. Meanwhile, UNCTAD hosted its third module of training under the Empowerment Program for Liberia. More than two dozens private and public sector stakeholders were trained on the roadmap for the Trade Facilitation Agreement. Importantly, the training set the stage for the participants who will be undergoing the Advanced Services Training in Stockholm in late November 2017 under the NBT techical assistance program.